It seems that the Trump administration is determined to bring back the Cold War and its arms race, only this time they’re on the same side as Russia. Or are they? I’ve been trying to get through my old e-mail, and came across a New York Times article (I get headlines sent to me daily) that says Russia’s modernization of its nuclear arsenal is the main reason the American government plans to do the same. Does Trump want more nukes so he can stop sucking up to Putin? And don’t we already have more than enough nukes to destroy the world? Are the extras in case we want to decimate other planets as well? It could just be part of Trump’s general tendency to undo everything Obama did, even if it means bringing back old conflicts. Apparently he hasn’t actually done anything about the nuclear deal with Iran, though, despite repeatedly talking about how terrible it is. It seems like the Republican response to it was, “The Iranians might break the deal!” Well, sure, but if they do, we have proof that they went against their word. What do we have otherwise? It’s bizarre that someone can say he makes great deals when he also repeatedly insults the rest of the world, but a lot about Trump is contradictory like that. When it comes to nuclear war, the stupid leaders might be the ones we have the worry about the most. 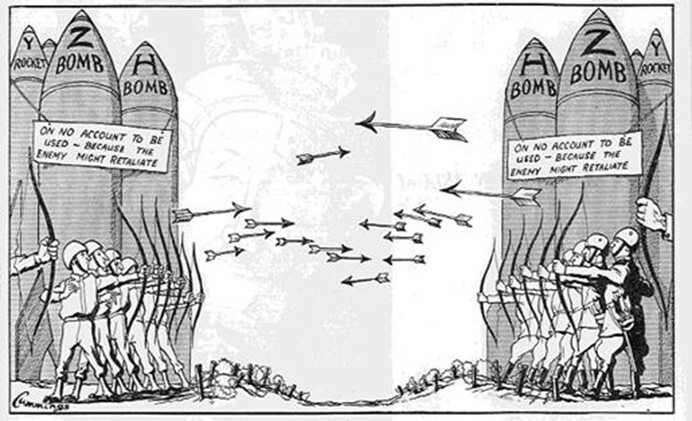 It doesn’t take a whole lot of intelligence to understand mutually assured destruction, but the impression I get is that some leaders just don’t care. But even then, we don’t really know for sure. Just because Kim Jong-un is enough of a wacko to try to convince people he never uses the bathroom doesn’t mean he’d have no problem having his country destroyed. I’ll admit I haven’t researched this much, but I’ve come across indications that Japan tried to surrender BEFORE the atomic bombs, but the United States didn’t agree, despite the fact that their conditions were mostly ones we ended up honoring anyway. Maybe I’m not remembering this entirely accurately, but I think I remember learning in high school that the bombing was necessary because surrender just wasn’t something the Japanese did, which, in retrospect, is pretty insulting. It’s one thing to say the concept of shame is prevalent in Japanese culture (and I’m not even totally sure how true THAT is, although it’s certainly what Americans are told), and quite another to suggest nobody in power in the entire country is familiar with the concept of cutting losses and negotiating. But I suppose othering political enemies is part of war culture, which seems more prevalent than ever with Republicans refusing to legislate guns in even the most minor ways, and Trump’s desire to have a military parade. But it’s hardly only Trump fans who participate in this. It seems that there’s a general tendency for propaganda to present enemy leaders as both total goofballs AND serious threats. 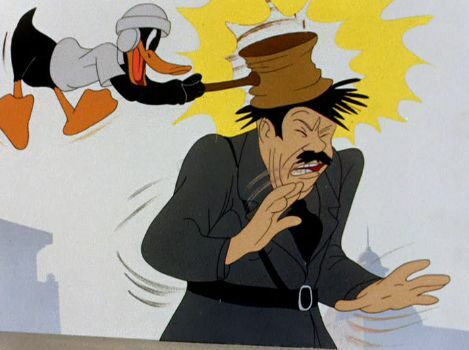 I remember watching some cartoons from World War II, and they often made Hitler about to be a gibbering lunatic while also encouraging Americans to make sacrifices for the war effort. But why would we need to do that to fight a mindless idiot? Of course, it IS possible to be both too crazy to properly function in society and able to cause real harm; people aren’t always stupid or mentally ill in the same ways, as I pointed out with Trump himself. The anti-Japanese propaganda was even crazier. You might have heard of the Popeye cartoon You’re a Sap, Mr. Jap, where a Japanese battleship falls apart (because shoddy Japanese products, although that’s actually somewhat less effective when you remember Popeye can destroy just about anything with his bare fists anyway), and a Japanese commander commits suicide by swallowing gasoline and firecrackers so he won’t “lose face,” going back to that stereotype of the Japanese being a shame-based culture. World War II was probably necessary overall, but that doesn’t mean the Allies didn’t make some major missteps. This entry was posted in Cartoons, Cold War, Current Events, History, Japan, Politics, Popeye, Prejudice and tagged adolf hitler, atomic bombs, donald trump, Iran, kim jong-un, north korea, nuclear weapons, president barack obama, surrender, vladimir putin, war, world war ii, you're a sap mr. jap. Bookmark the permalink.